"YOU'RE NOT SUPPOSED TO BE FEEDING ME, YOU KNOW." The seagull had that certain sort of look on his face that seagulls get from time to time. The sort of look that's comprised mostly of indifference, mixed in no particular order with authoritativeness, a dash of know-it-all bourgeois attitude, a wide-ranging condescension towards life in general, and an overall sense of smugness. It’s a special sort of combination. A combination that seagulls are nature’s best at exhibiting. One that nearly instantaneously lets you know that whatever it is you’re doing – however it is you’re choosing to exist at that very moment in time – it is not nice, it is not helpful, it is not necessary, it is not important, and it is certainly not a courtesy to anything or anybody. All of which was fairly coincidental. Because it just so happened that, only moments before, Josie had thought she was being all of those things. She had innocently thought the seagull looked hungry. And a little lonely, too. The seagull examined the bits of bread Josie had torn off from her sandwich and tossed toward his direction. His head switched from one piece to the next, and then to the next, and then to the next, and then to another before twitching back to the first and then back again to the last. He was swift. He was efficient. He wasted very little energy in his inspection. He was as thorough a seagull as Josie had ever seen. “There’s a sign,” Mr. Seagull replied. “I said there’s a sign. Over there. Right next to the entrance of the beach. Look there.” Mr. Seagull pointed with his wings. The wind tickled his feathers, like keys to a piano. Of course, she had seen the sign beforehand. It had been impossible to miss. It was big. It was ugly. It had big, ugly letters crudely painted on it. It cast a shadow along the pathway to the beach. It made the sand underneath it wet and chilly and uninviting. It had been laden with misspellings, too. So she had noticed the sign. It had been a sign worth noticing. “Other seagulls. You didn’t feed Brett, did you? Josie had thought he had looked hungry. And a little lonely, too. Now she sat in her chair, hungry and alone herself, without her sandwich or the bag of chips she had brought along with it. And she watched Mr. Seagull gobble down each one of her crimes against the community. And when he was finished with that she watched him waddle away with an indifferent look on his face, a look that was mixed with a bit of condescension and a know-it-all attitude, presumably on the lookout for other people who thought they too were being nice and courteous. And she began to wonder. Who put that sign up anyway? Rachelle Meyer graduated with a degree in Studio Art from UT Austin. Her talents have been used to interpret the work of authors such as Dave Eggers, Audrey Niffenegger and Nick Ortner. She now lives in Amsterdam with her English husband, her Dutch son, and her cranky old New York cat. You can find out more on her website HERE. David Novak graduated from Rutgers University with a Masters in City and Regional Planning. He now works in a fairly serious job that’s constantly sending him to strange and mysterious places all across the great state of New Jersey. You can find out more on his website HERE. 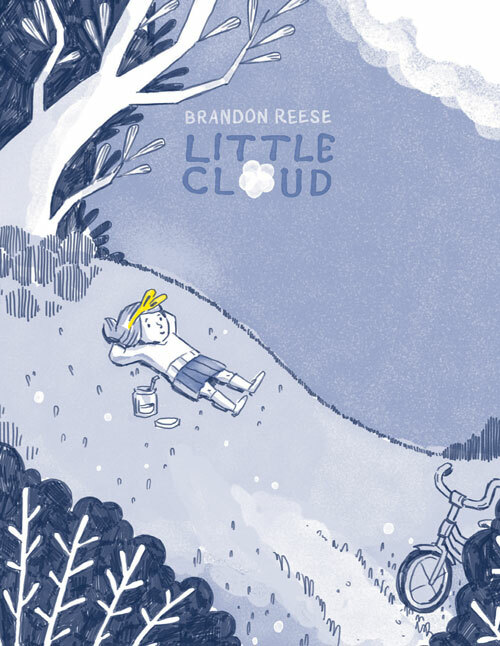 Little Cloud can be purchased as a mini comic from Brandon HERE! SHE WAS FIFTEEN WHEN SHE SAILED ALONE TO AMERICA TO MEET HER INTENDED–TWENTY YEARS HER SENIOR, WHO SHE'D NEVER LAID EYES ON IN HER LIFE. At the boat, her father, to whom she was the sun, said, “We’ll come over in one month. If you don’t like him, don’t marry him.” She met him and she married him before her parents’ scheduled arrival; unbeknownst to her, her father had perished in the cholera epidemic that swept through Izmir. The relatives she’d come to stay with decided to say nothing so that her wedding day would remain untarnished. But after the ceremony, as she was passing the traditional tray of sweets, she overheard a snippet of something and turned, astonished – lovely in her bridal finery – and said, “My papa is gone?” And then she dropped the tray and fell to the floor in a faint. Thus, her married life began. They went to live by the ocean, on the outskirts of the city; she was enchanted with the boardwalk, with the names of the streets: Neptune Boulevard, Mermaid Avenue. He was a smart man, good-looking, but his luck was clumsy; life with him was as much a roller coaster as the one they could see from the windows of their various dwellings. During the years he was involved in bootlegging, their lives were lined with silk: maid service, fittings at the dressmaker’s, guests for dinner in rustling gowns and elegant jackets; she learned to fit a cigarette in its holder and flourish it in the air like a woman in a magazine advertisement. When prohibition ended, they moved to Twenty-third Street and he leased a booth on the boardwalk, but the life of a barker repulsed him; he thought it demeaning to cry his wares to the indifferent crowds, competing for meager sums that might build a fortune. He always seemed to hear the world calling for him and was out the door most of the day and sometimes at night, gathering on the boardwalk with other men from the city of his youth, gathered in the sand around the stars and a bottle. She, meanwhile, raised their children, visited with her mother and sisters, who had come over later, one by one. She never reproached him; instead she managed the bills, the meals, no one ever went hungry. But sometimes at night while the children slept and he was out with his men and his bottle, she watched from a window the path of moonlight that rested on the water and she dreamed of walking on it, all the way across the ocean, to where another life might be waiting. The boardwalk closed for the winter, booths boarded up, roller coaster silent, sulking in the cold, waiting for warm weather and the clamorous crowds that crammed the streets, the subways, clutching their counterfeit treasures. It was during these seasons of orphaned light that they grew closer; he’d be home at night listening to the radio while she washed the dishes, sometimes grabbing her from behind, dancing her around the kitchen, holding her close as he had in the early days of their short courtship, while the children watched, rapt, from the doorway. Sometimes she’d waken to his arms enveloping her, turning her toward him so that he could trace the map of her face with a calloused finger. At those times she felt remnants of the safety his age and manner had promised when they’d first met and his eyes had been filled with silent promises, and she didn’t think they needed words to reveal their hearts. But then he’d be laid off from whatever seasonal job he’d taken to get through to the spring and she would work part-time checking coats at The Velvet Slipper night club, watching the women shimmering across the dance floor, the perfumed air making her dizzy with yearning. She would watch and remember the days when she, too, had shimmered, and then she would wonder about the children and how they were growing and what would become of them. The years went round like the Wonder Wheel that hung high above the boardwalk, shrieks emanating all the way to Twenty-third Street whenever the famous Ferris wheel squealed to a halt and patrons were left swaying in the wind that came off the ocean. He would never escape the prison of his own thoughts, that he was destined for better things, but the bottle had turned the diamonds in his mind to charcoal and the memories of other bottles washing up along the shore, of silvery-scented women and tuxedo-clad men coming up the steps faded as did any drive he once had to reverse his shattered fortune. She dimly understood his surrender and part of her, but only part, surrendered, too; she worked full-time now, taking coats at The Velvet Slipper, as the children were almost grown and her daughters could help out with the cleaning and shopping and supper. Sometimes she woke up in the middle of the night and felt his coiled restlessness beside her; she thought of reaching around to take his hand, but most often she did nothing. She grew to love sweets – her one selfish pleasure; no gift pleased her more than a one pound box of Zimmerman’s Chocolate Specials, which she devoured after a perfunctory offering to the rest of the family. She lost the slender loveliness that had defined her girlhood but the light never left her face, so that her children and her sisters and even her mother looked to her in times of distress, awed by her ability to still believe that people were good. Once, while trying to comfort a daughter who’d found out her Manhattan lover was married, the daughter turned to her, tear-stained and disheveled, and cried out, “But how can you possibly understand? You’re too good to understand anything!” She was taken aback by this outburst, and then she felt an overwhelming guilt, that she had so successfully hidden her secret thoughts of walking across the water on a moonlit path, leaving them all behind. And when the end came, when they believed it was finally over, he raised himself from his sweat-stained pillow and said to her, “In case I never told you, in case I never said it before, this life…this life…I could never have done it without you.” She smiled then, and leaned forward and kissed him gently, and suddenly she closed her eyes and grasped his hand tightly, leaving marks on his flesh, and then, slowly, very slowly, she released him. She let him go. 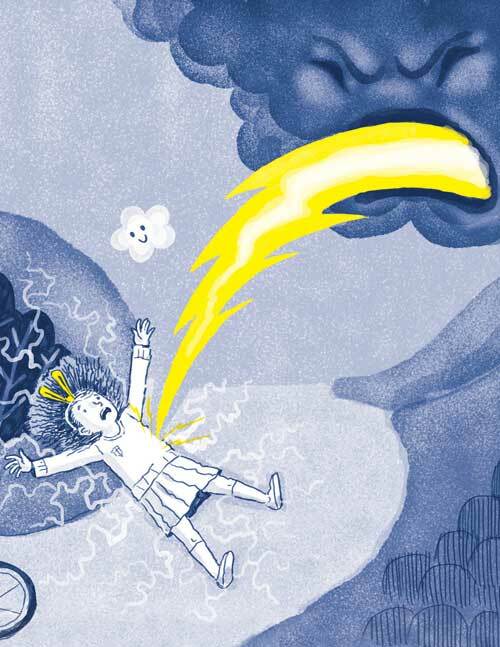 Jago has produced illustrations for over 40 books, a couple of TV shows and a few magazines. He has recently finished a book called An Ambush of Tigers that is being published by Millbrook Press in the US. 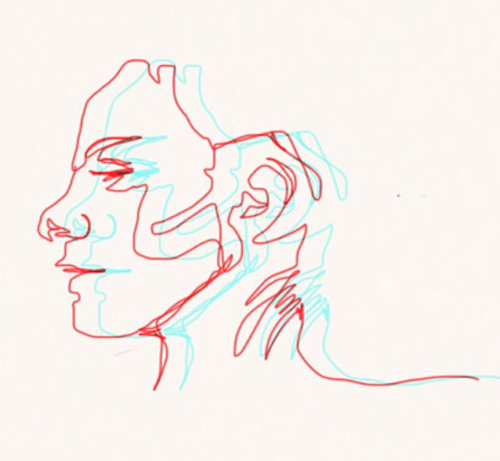 He is also the illustrator of our beautiful cover. 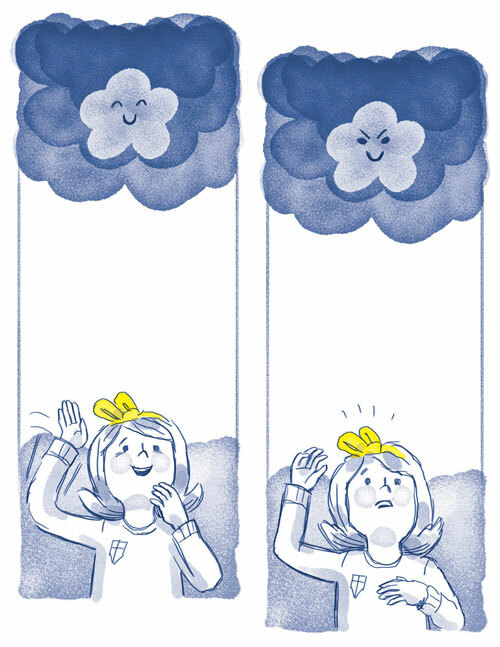 You can buy prints of these illustrations from the artist HERE. Judy Chicurel’s writing has appeared in national and regional publications, including The New York Times, Newsday and Granta. Her new novel-in-stories, If I Knew You Were Going to Be This Beautiful, I Never Would Have Let You Go is out now from G.P. Putnam’s Sons. You can find out more about her book HERE and you can buy it HERE. SHE IS NOT FROM LITTLE ROCK. Here on business, she tells him. In the morning she will drive a rented car through dying towns until she reaches Bentonville. They have a museum there, James says. One of the biggest museums in the country. Right in the middle of what used to be nothing. One, he repeats. He is dark, see-sawed with the ink black lines of his own arms lifting and lowering. Grease smudges his fingers; he’s washed them three times since leaving the factory. He wipes them on his jeans again. It’s so much like him it annoys her. What about you? Shannon leans closer. Her hair swings, dark and straight. It’s a different look for her. Where are you from? she says. What do you do? McGhee. Came up here for school. The dirt drawls out of his mouth. He leans back in the chair, straddling the seat. Amber lamplight and whiskey-brown bottles and the glow of the exit sign shade between them. She doesn’t ask him how work was today. She doesn’t want him asking how her day went. The loose shirt hangs off of her shoulders. She takes another drink; she is drinking hard. You’re lying about school, she says. She’d said the same thing when she asked for his name. He taps his fingers against the top of the table. I’ve got nothing to do tonight, she tells him. He says, You could do something with your husband. She likes the dark in his eyes. She ignores the hurt. Her earrings swing, the small hoops glint silver. My husband is a liar, she says. Folding her arms over the table, she leans forward. What do you do here, in Little Rock? His beer is gone. He folds his hands in front of his lips, teethes the edge of his thumb. He works. She knows what he is thinking. He works hard all day. He goes home and he makes dinner. He runs. He tries to talk to his wife. She calls him a liar for telling the truth and calls him a liar for telling lies. He gets bored by this. The dirt is thick now. Dragging himself up, he stands over her. His shadow is the deep dark on the wild side of the levee. In the motel, Shannon fumbles, pretending to be shy-fingered with his belt. You look pretty in blue, she says. Her mouth burns the words down. She loves and she hates his wholeness. I don’t have off Wednesday anymore, he finishes tugging the belt off for her. It is dark in the room. He pulls his shirt off. Drops it down. She knows he works too hard. She does not want to think about this now. Folding her arms over her chest, she waits. At his sides, his fingers curl, fragile and unsure. His hesitation means she has won. He pushes her against the wall. He looms, beautiful and monstrous. He takes her hips, he pushes her skirt up to the tops of her thighs. Maybe he will push her skin away with his hands too. He takes her mouth. He doesn’t kiss her slow and soft. She is glad he remembers. The emptiness in their stomachs slide tight together, the little she’s eaten for lunch lurches in the rot of shots and beers. He touches the hem of her shirt. It’s gone, the doctors told them after her surgery. They will keep testing, but for now, she is healthy. It’s not gone, they don’t know, Shannon has told James. She hasn’t told him she feels it, alive, growing inside of her. He lifts her. She doesn’t wrap her legs around him. He doesn’t shove and push. Slowly, carefully, the way she doesn’t want him to, he wraps his fingers into her shirt. She palms at him, drags her nails down his shoulders. In the morning, at work, her scratches will sting. He will like it until he thinks too much about it. With the machines turning the wires, in the noise and the heat of the factory, he will think about how she feels. He will feel sorry for her. Maybe, when he comes in, quiet and tired, to sit at the counter to take his boots off, he is thinking: Why are we here. He doesn’t say, you can feel like you felt before. Her friends say she can feel like she felt before. They smile at her. They sit in restaurants talking together about the same things. They look at the menus. They cross their legs. She crosses her legs too. For a moment then, sometimes, all of that sameness makes her feel like herself. It makes her feel like them. James sets her down, he draws his stomach and his hips and his thighs away from her. She does not answer. Tonight she wants to cry. She wants to scream. She only cries when they are strangers. Not the stranger she loved when they got married. Not the new kind of stranger he became in the doctor’s office. She wants the stranger he can become in the dark, the unyielding shape of a man who won’t tell her she is beautiful because he hurts for her. She wants the man who hates himself because he cannot see her the same even while he says he loves her the same. She knows he does not understand. She does not understand either. Bending his elbows, he lowers his head, he thumbs her red cheeks. Her make-up smudges. Muffled together, they move in the quiet of half hitches, in staggered, broken inches. Her thighs open. He presses. Their lips touch. He talks in half words, hushed against her mouth like he is trying to talk into the space of before now. He says small things about beautiful, small things about not alone, small things about forever. She does not answer. He is inside of her. They are inside of each other. The silent tangle roots deep and rises, clear-cut but alive. Do you want me to get the implants? she whispers through the dark of their lips, to see what he will say. He is careful with his answers. I want what you want, he has said before. I want what you want, he says now. THEY HAD BEEN KNOWN FAR AND WIDE ON THE VAUDEVILLE CIRCUIT AS DABBLE AND DRIFTWOOD, VENTRILOQUIST EXTRAORDINAIRE. Together with the Pondicherry Twins who tap-danced in eye patches while twirling flaming cutlasses and the Magnificent Montreaux, the mute mulatto magician, Dabble and Driftwood shared equal billing on marquees up and down the Eastern Seaboard. Though the venues were often too risqué for polite society, grandes dames and their hothouse lily ingénues invited the comic duo into their burgundy-hushed parlours where the flicker of the gas flames gave the act an almost sinister air that titillated the hoi polloi and sent one taffeta-trussed matriarch swooning for her velveteen fainting couch. The lots were cast on a shrouded All Hallows Eve when a dinner party was thrown at Mrs. Eloise Bentham’s three-story brownstone on the Upper West side of Manhattan overlooking Central Park. The highlight of the evening would be a séance conducted by the well-known spiritualist, the Principessa Morte. Upon arrival, the medium intimated that she had an urgent message from the other side for Mrs. Bentham’s youngest daughter, Cassandra, who had a reputation even at the innocent age of fifteen of possessing a fragile charm that endeared her to hard-hearted hellions and crusty crumudgeons, alike. Well-aged claret, bloody as raw rubies, was poured magnanimously into Bohemian-cut crystal by Blunt, the butler. Men were dressed in formal dinner wear, their white shirt fronts blazing like fallen angels’ wings. The women were feathered and furred and finely-garbed in the latest fashions from the better-known couture houses in Belle Époque Paris. Cream and topaz and buttery yellow along with gems the size of babies’ fists dazzled in the fluttering gaslights mounted on the garnet-flocked walls. Dabble and Driftwood were privy to the evening’s spirit soiree. 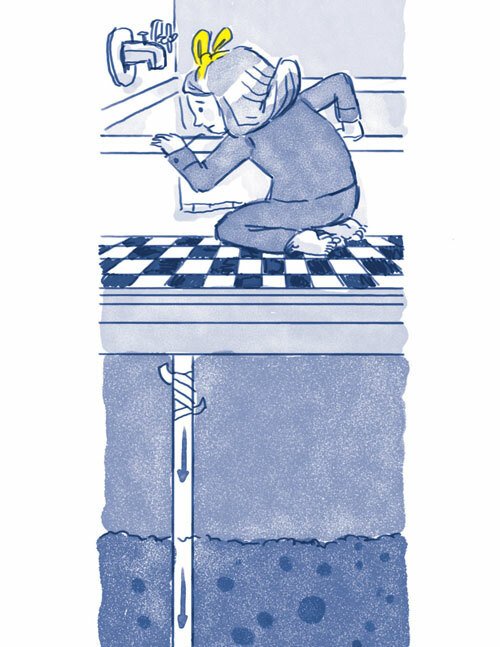 They had preformed after the Principessa’s dramatic appearance: a crack of thunder that seemed to shake the brownstone’s foundations accompanied her as she stepped across the recital room’s threshold. Afterwards, a table was prepared with a satin cloth, black as the depthless voids betweeen the constellations, and a water-filled porcelain bowl, white and virginal, centered under the chandelier that still was lit by smoky-fingered tapers. Blunt materialized from the shadows with a brass candle snuffer in the shape of a lion’s maw to extinguish every odd-numbered flame. So they assembled. Dabble and Driftwood found themselves beside the gentle Cassandra. She had seemed to enjoy their witty repartee and slightly off-coloured humor. During their performance, the youngest Bentham had held up an embroidered handkerchief as she expressed bemusement at some of the more delicate jokes. Under the watchful eyes of Old Man Bentham’s darkly drab portrait, Dabble’s heart stirred for that simple rose bow of appreciation that graced Cassandra’s lips. However, he wasn’t alone with his attentions. Driftwood was intrigued too. Which, of course, always proved difficult for Dabble because women were always more smitten with his sidekick’s sass and sensuality. To Dabble’s dismay, Cassandra was no different in her bashful sentiments towards Driftwood. As the bulky curtains billowed and blew from the gathering storm and the chandelier flames quivered and went out with a starkness like sin, Cassandra gripped the ventriloquist’s partner’s hand. Peering at Dabble under half-hooded eyes, the Principessa Morte shrieked Desire before collapsing into lifeless insensibility. Dabble placed Driftwood into the purple velvet interior of the leather carrying case made from Okefenokee swamp alligators. It was another good night at the Orpheum. The crowd was rowdy and willing to go down the road of the perverse with an ease that came from bawdy delights to distract a hand-to-mouth existence. The ladies in their faded second-hand finery with mismatched buttons and re-stitched seams were accompanied by men with day-old whiskied whiskers and worn elbows and shiny-kneed trousers. They hooted and hollered, catcalled and clapped until Dabble and Driftwood took a second curtain call. He contemplated his sidekick, staring up at him from the comfort of the case. Another letter from Cassandra had been delivered to the theatre this morning. Dabble no longer possessed the capacity to be generous. He did not wish to rise to the occasion and show himself the better man. He had his fill. Loneliness lived in the hollow cavity where his heart should’ve beat. Even the acrobatic contortions of both Pondicherry sisters could not assuage his despair. So, he had torn open the lilac-scented envelope and read its girlishly curved script. Yearning played coquettishly amongst the cautious words of endearment. Cassandra’s affections towards Driftwood were unbearable. And what confounded beyond comprehension was his partner’s absolute disregard for the girl’s budding fondness. But that was Driftwood. Women grinned and giggled behind kid-gloved hands. They tried to capture his gaze from the corners of their kohl-edged eyes. Finely calligraphed calling cards were sent for parlour visits. However, Driftwood could care less; his eyes were blind towards feminine entanglements. If the truth was revealed, his sidekick’s interests ran towards the unnatural attentiveness for the burly and bearded in the audience. In Atlantic City, a stocky stevedore was seen loitering behind the theatre and Driftwood had not returned to their shabby room at Mrs. O’Leary’s boarding house until the damning dawn. The phosphorus match was simply there in Dabble’s hand. He gazed down at his partner and friend of more than a decade. There had been moments of lavish decadance and procured gentility. The world was our oyster, Dabble mused before striking and letting the flame fall. The dusty velvet and the salty oils on alligator leather from years of opening and closing flared and caught like dry tinder, like forbidden desire. Max Allbee is an illustrator, muralist and teaching artist from San Francisco, currently living in Brooklyn. Max has a deep love of hand lettering, extreme detail and sepia toned themes of nostalgia. ONE AFTERNOON IN OCTOBER, JEREMY KELLOGG CAME HOME WITH A RAILROAD SPIKE PROTRUDING FROM HIS HEAD. 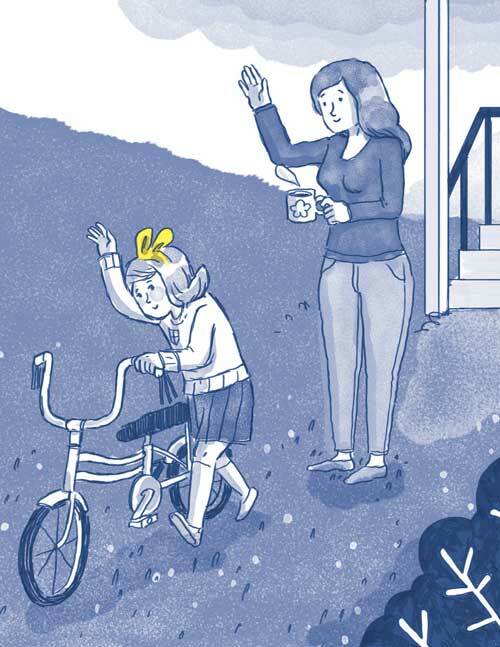 He seemed otherwise the same, and nothing was bleeding, so his mother tried not to get alarmed. Perhaps it wasn’t really a railroad spike, but one of these softer, wooden things you heard about. No time to ponder; she had a home-visit client at four, Mr. Corby, who could be more than difficult and hated her to be late. “I know it must hurt,” she said. “Like what?” his father demanded. “That would get you what you want,” Dad said with a snort. The spike stood out of Jeremy’s scalp three inches, its heavy offset head battered by sledgehammers, the shaft maybe an inch square. If the whole thing was eight inches long – Mrs. Kellogg’s estimate – then five more were in Jeremy’s brain. “I simply don’t see it, Jeanne,” Dad said. Jeremy pointed, even tapped his finger on it. “I’m not dead,” Jeremy said. “Case closed,” his father said. “We’re not fighting,” Jeanne said. “As if you guys care,” Jeremy said. Jeremy had a check-up anyway, so Mrs. Kellogg took the opportunity to ask about the spike. “But what about the idea of having it removed?” Jeanne said. And in fact, Jeanne did start to notice other kids with railroad spikes in their heads, also tent pegs, those old-fashioned steel ones. It wasn’t exactly reassuring to see, but it did make her feel less alone. Phil still wouldn’t acknowledge that anything at all was different about Jeremy, even when the boy came home from Saturday League with an axe in his face, one of those huge medieval double-edged battle weapons. Long wooden handle practically touching the ground at Jeremy’s feet and making him shuffle, the blade cleaving his features from forehead to chin, not perfectly symmetrical, but close. As with the spike still in his head, no blood. Phil had picked the kid up downtown. “Okay, tell me you don’t see that,” Jeanne said. “See what?” said her husband. “Watch the attitude,” Phil said. “I’ve got lunch ready,” Jeanne said. Jeremy poked a bite of macerated salad around the thick steel of the axe, poked it back with the handle of his fork to where he could swallow it. He wasn’t able to chew, had to accommodate the axe handle too, his head way back, his chair at an angle to the table. “When will it all end?” Jeanne said. The next day he came home with an arrow through his chest, pretty fletching, at least, brightly colored plastic feathers out in front of his heart, the sharp point emerging from his back. This time there was a little blood. Jeanne went for the Neosporin cream, but he wouldn’t let her put it on him. No point in going to Dr. Smidge – he’d just say it was all perfectly normal. “What do you think?” Jeremy said. “Other kids manage,” Phil said. Jeremy got up, the axe handle bumping the table. “He looks miserable,” Jeanne said. Bill Roorbach’s newest novels are The Remedy for Love and the bestselling Life Among Giants, both from Algonquin Books. Life Among Giants is in development at HBO for a multi-year drama series. You can buy his book, The Remedy for Love HERE. EDITORS’ NOTE: You will also be able to find “Just Fine” in Bill Roorbach’s forthcoming collection of short stories, The Girl of the Lake, to be published by Algonquin Fall, 2016. Highly recommended!